Large scale scenarios often include paintball tanks, and typical rules state that they are impervious to small arms fire. So how do you eliminate tanks? Why rocket launchers of course. Milsim Rockets is a manufacturer of, you guessed it, milsim rocket launchers. 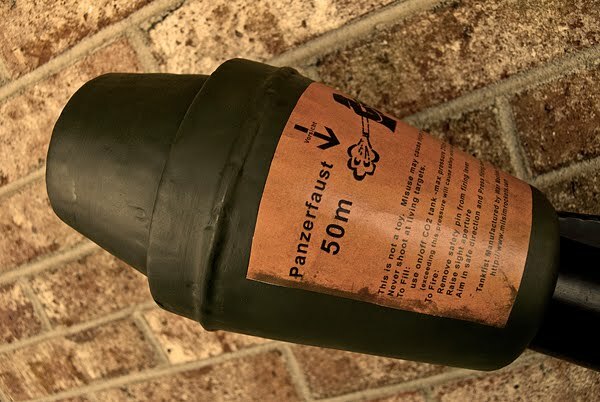 They offer three such launcher ripe for scenario games: a Bazooka, a Panzerfaust, and the instantly recognizable RPG-7. All the launchers run off remote lines (preferrably a Proconnect system), and have a 250 psi operating pressure. So whether you're storming the beaches of Normandy, doling out a Blitzkrieg, or acting out a good old fashioned insurgency, Milsim Rockets has you covered.